As much as politicians like to say they’re not beholden to the “Hollywood elite,” they seem to change their tune when the time comes to rake in the enormous piles of cash required to actually run a campaign. The crop of 2020 hopefuls are no different. 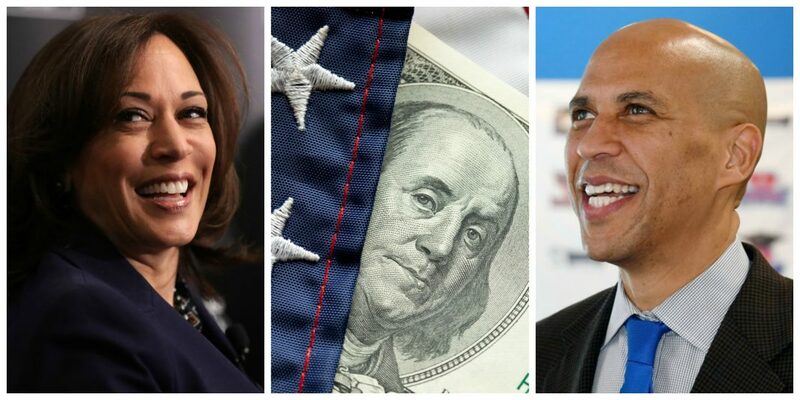 Going into the early primaries, Kamala Harris appears to be ahead in the Hollywood political donation derby, but Kirsten Gillibrand, Cory Booker, Elizabeth Warren, and even Joe Biden, have been checking in on their famous friends with deep pockets. Last week, a fundraising swing through L.A. saw Senator Harris meeting with big-dollar players including Jeffrey Katzenberg, Jennifer Salke of Amazon Studios, Paramount CEO Jim Gianopulos, and filmmaker Lee Daniels. She also attended an event at the home of David Cooley, owner of the Abbey, and co-hosted by Lance Bass and Jesse Tyler Ferguson, where Variety noted the reception was “especially enthusiastic.” In her previous races, Warner Media Group and 21st Century Fox employees donated a combined $218,933, with both corporations ranking in her top donor sources. Joe Biden hasn’t announced a 2020 bid, but his name recognition and long-time relationships with prominent Democratic fundraisers can’t be overlooked. In October, Katzenberg hosted an event to raise money for Biden’s political action committee, American Possibilities. As of the PAC’s last public filing, it had $2,637,781 on hand; Dreamworks SKG is among the top contributors. Other contenders have been spotted doing the money dance in town, including Corey Booker, who has benefitted from the fundraising help of X-Men and Deadpool screenwriter-producer Simon Kinberg, and Kirsten Gillibrand, who has appeared with celeb supporters like Chelsea Handler and Connie Britton, the latter of whom was Gillibrand’s roommate when both were college students doing a semester abroad in Beijing. Some celebrities prefer to show their early support by writing tweets rather than checks. While she hasn’t topped fundraising lists, Elizabeth Warren has received social media hype from stars including Cher, Barbra Streisand, Danny DeVito, Rob Delaney, and John Fugelsang.